One out of every five children in your town is unsure where or when they will get their next meal. The Salvation Army’s approach to feeding the hungry is formed based on the local needs of each community we serve. Those in need across the Midwest can get nutritious, hot meals or groceries from their nearest Salvation Army Service and Worship Center. We feed thousands daily, including the most vulnerable of our communities — underserved children in our after-school programs, the elderly at our Adult Day Centers, forgotten friends at our homeless shelters, people looking to better their lives at our addiction recovery facilities, survivors rebuilding their lives after a disaster, and domestic violence and anti-human trafficking victims. Our Bed and Bread® program engages supporters like you to give monthly to help us feed more than 25,000 hungry people daily in cities such as Detroit, Chicago, Minneapolis and St. Paul. The Salvation Army feeds an average of 150,000 meals every single day. Anyone in need of a nutritious meal can find one at The Salvation Army. This includes homeless people of all ages, as well as individuals and families who may be down on their luck and in need of extra assistance. Not only do we address the immediate need, we also to help identify and treat the root causes of poverty. Over time, this holistic approach to meet the physical, emotional and spiritual needs of each person helps moves many from hungry to fully healed. We help anyone interested in the Federal Food Support Program get a jump start with a pre-screening. Once we determine eligibility, we offer help filing the application. No one should ever go a day without a meal or feel ashamed about asking for help. That’s why many of our locations provide hot meals and free groceries year-round to anyone who needs them, no questions asked. For homebound seniors, many areas even offer grocery delivery services. Contact the location near you to learn when meals are offered or which food shelf serves your area. You may need an appointment for groceries, depending on the location. Many of the people we serve are also in need of community. Our community gardens provide a no-cost, renewable source of produce, as well as vital work structure and community-building for those who tend it. Hungry children suffer the most. In the United States, one out of every five children under age 18 is unsure when they will get their next meal. Hunger is an epidemic around the world that affects tens of millions, including people here at home. Together we can cure hunger for thousands today. 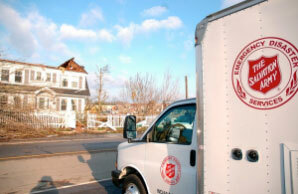 The Salvation Army provides food in almost every ZIP code across the U.S. Donate now. Your gift to The Salvation Army provides hot meals and groceries for families in need. Donate now.